Pond – Great Gardens, Inc. This is probably the most unique project we have been involved with. It is a distinctive blend of land, eclectic architecture and client needs which presented an interesting challenge to meet the quirkiness of the architecture with an equally thoughtful landscape. The landscape could not over whelm the architecture but rather set it off. 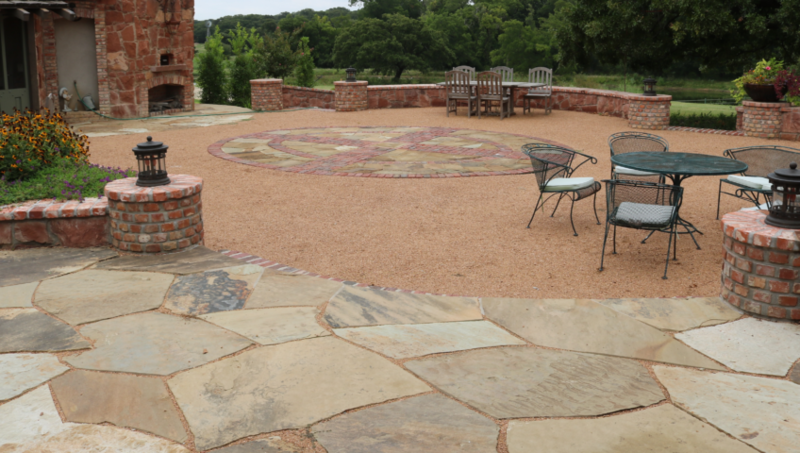 Additionally, the homeowner had amassed a treasure trove of antique bricks and stone to incorporate into the hardscape. This first phase developed the back courtyard space, creating terraced patios for entertaining. Every angle of the structure is different and there was a 3.5 foot fall between the house and the existing grade. Terracing and connecting various entries onto the patio that made sense with seating large parties, while maintaining a seamless flow, was a high priority. Small beds were added to offer some “green” relief between the hardscape and structure. The other special element that consumed hours of design time was creating a fountain feature for the front entry courtyard. Elizabeth had an image of a multi-tiered basin with staggered spacing. We attempted to find prefabricated iron pieces for the basin posts to keep costs down but that was not to be. So we moved onto Victorian style iron fence posts that had hollow middles. Each of these had to be adapted to different heights and thanks to a patient and talented welder we were able to bring the design to fruition. Then Charlie Claffey, of Claffey Pools, performed his magic and made the fountain flow. The result was just as we imagined.